TRICKERY IN NATURE. In 1862, the English explorer-naturalist Henry Bates returned from a decade-long exploration of the Brazilian Amazon rainforest and, after examining almost one hundred species of butterflies, he reported his unusual findings. Of particular interest were two distant families bearing a close resemblance: one family, Heliconidae, is brightly colored and unpalatable to birds; the other family, Pieridae, is also colorful but palatable to predators. Bates surmised that the coloration of the unpalatable species proclaimed a warning to potential predators of their poor taste based on the birds’ previous experience. He also noted that some palatable butterflies bearing a close resemblance to unpalatable ones were avoided by predators. This has been called Batesian mimicry. Other favorable evolutionary adaptations involving mimicry have been observed in nature. The mimic gains an advantage from its resemblance to another organism (the “model”) and a third party mistakes the mimic for the model, such as the harmless colubrid snake that mimics the characteristic “hood” of the Indian cobra’s threat display. The third party may be a potential predator or a potential prey of the mimic. Following observations by Bates, other examples have been seen in plants and animals, and in some cases, plants mimic animals and vice versa. The most common examples of mimicry are based on appearance, but sound, smell, and behavior are also imitated. The German zoologist Fritz Müller noted in 1878 that two unrelated and unpalatable species of butterflies had similar color patterns, and each had adequate defense mechanisms—an apparent exception to Batesian mimicry. 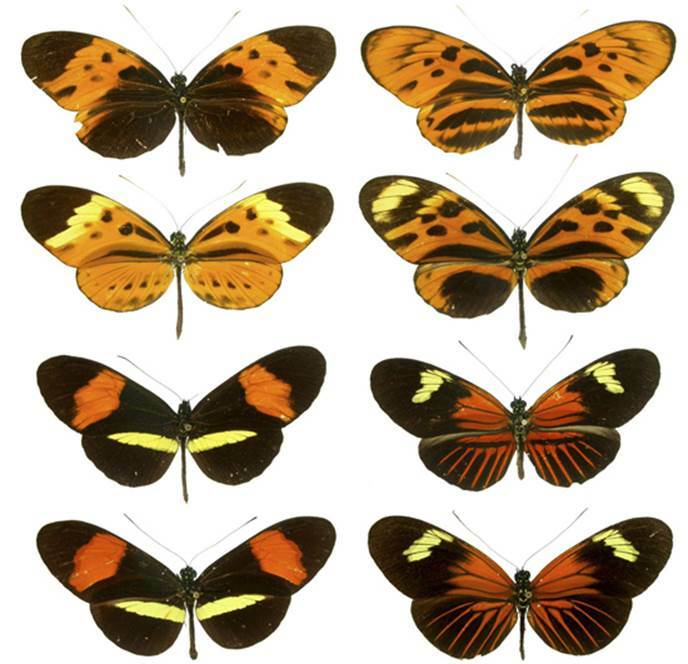 But once a predator had learned to avoid a butterfly with one color pattern, it would avoid all other species with a similar pattern (Müllerian mimicry). Animals exhibiting aposematism transmit a warning signal (pronounced color, sound, odor, or taste) to potential predators that they possess a secondary and more potent defense mechanism—as do the brightly colored poison dart frog or skunk. Aggressive mimicry can be used to escape the detection of potential prey; similarly, in an example of inter-sexual mimicry, the male cuttlefish camouflages itself as a female in order to escape the detection of other males and get closer to females. And some plants, including orchids, mimic female bees and wasps to attract males, which results in pollination of the plant. SEE ALSO: Amazon Rainforest (c. 55 Million BCE), Animal Coloration (1890). This illustration shows four forms of Heliconius numata (top), along with two forms of the poisonous H. melpomene (bottom, right) and the two corresponding forms of its poisonous mimic, H. erato (bottom, left). The correspondence in warning colors between H. melpomene and H. erato is a demonstration of Müllerian mimicry.